You are here: Home » ilg finishes a Blessed Season with another OVERALL TITLE!!! ilg finishes a Blessed Season with another OVERALL TITLE!!! 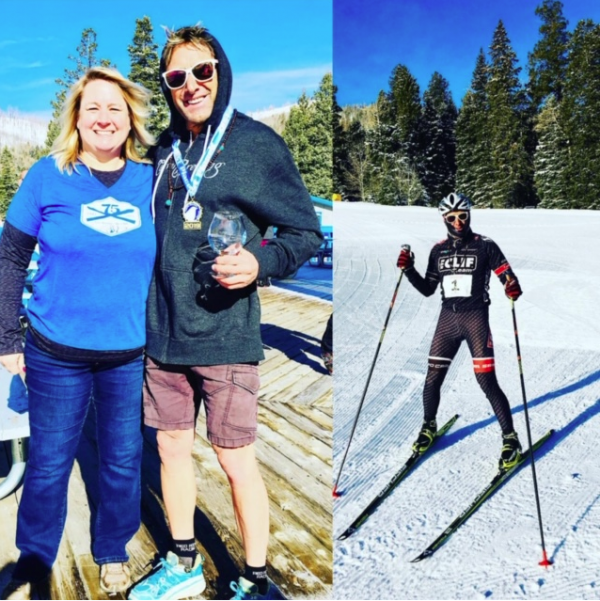 pics by HP Yogini Sandra Lee of your feeble teacher using every HP Yoga® arrow in my quiver to pull out a stunning Overall Podium Win this Saturday at the 43rd Pajarito Pinhead Challenge near Los Alamos, NM. your feeble teacher is HONORED to be on the scroll of the amazing uphill/downhill skiers which have won this race for decades. to be 56 years-old and still winning OVERALL Titles across several sports? the merit of what your feeble teacher attempts to teach and Transmit. sensing the auspiciousness, ilg chose to go for the Pinhead Challenge as a rookie and check it out… still had fitness fr(om) a Blessed season, and was really wanting a long, hard uphill grind with a techy descent to test wholistic skiing skills… ilg got what ilg desired! Race Morning: arrived at venue before any other racer. got Bib #1. ha! big decision: this is an Uphill/Downhill race; you gotta ski UP 1,440′ vertical before skiing down advanced intermediate alpine ski runs on either Skimo (ski mountaineering) skis, or skate skis. the uphill course for skate skiers is longer, yet more gradual to the summit. the skimo course is steeper, yet more direct. hmmmm…. ilg weighed the options long and hard. knowing the flavor of the ski resorts gradients, ilg reckoned ilg would lose time only during the middle, most steep section of the ascent yet gain time in the early traverse sections and at the summit traverse section before the downhill. now, skiing fast downhill on advanced alpine ski runs on SKATE SKIS?!?! well, not for the timid or unseasoned. ilg felt confident that ilg could deliver at speed the downhill on skate skis against the skimo guys that would have metal edges, and much wider skis, and locked down heels. to hell with locked down heels! ilg is Skate Skiing this thing! early morning (our start time was 8:15a) cord was frozen solid at 10,000’+… ilg was suddenly skiing down 16% slopes on skis without edges and barely 2″ wide! you think you like skiing speed? well, let ilg tell you: SPEED IS RELATIVE!!! CRUSHED the downhill at speeds over 30 mph on SKATE SKIS and increased my gap over 3rd! ilg is bringing my skimo set up!